CLEVELAND - The base paths of Progressive Field, with only minor efforts needed by the grounds crew to drag the infield, looked nearly as pristine in the eighth inning as they did in the first last night. By the end of eight, the Indians had gotten two men to third base. The Red Sox hadn't gotten one past second. 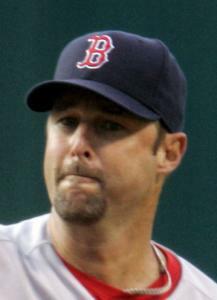 Credit Tim Wakefield, the ace so far of the Sox staff, and Cliff Lee, last year's Cy Young Award winner, for the dearth of offense and the swift pace of the game. Each side had exactly six runners through those first eight innings, walks contributing runners for Wakefield, hits for Lee. So it was that a crowd of just 18,652 got to see a game that would come down to the end, with nothing doing offensively in the beginning or middle. Then came that end, a ninth inning in which a walk to Dustin Pedroia was followed by a David Ortiz single that fell in front of center fielder Grady Sizemore, bringing up one of the hottest hitters in baseball. But Kevin Youkilis's plate appearance left only a piece of bat skidding between third base and shortstop, another out on the scoreboard, and a chance for Jason Bay. "I think he's a good player," said manager Terry Francona. "And I think good players get opportunities. There are some things that led up to that - Pedey laying off a good 3-and-2 breaking ball on a guy that's throwing 97 - but he took a good swing. "Maybe 'clutch' is you've got to be good enough to have the talent, then when the opportunity comes, you don't try to do too much, or do more. But it's certainly welcome." So, too, is the brilliance from Wakefield, who gave the Sox seven one-hit innings. In the first game of the winning streak, against Oakland, the Sox were desperate for length, desperate for a good start. Wakefield delivered that day, and he hasn't stopped, though last night's win went to Manny Delcarmen. Take out his first start against the Angels - a pedestrian six innings with three runs - and Wakefield has a 1.17 ERA in his last three outings. It seems clear that Wakefield is on one of those runs, when the opponent, batter, and venue don't matter. "We've seen it," Francona said. "He just continues to do it. It takes Wake all spring, and that's why they have spring training. You see him the first day, a couple innings, he's getting hit around, then when the season starts, he's ready, and it's good. He just keeps doing it. It's fun to watch." Wakefield's knuckleballs, while bedeviling the Indians, also at times got catcher George Kottaras in a knot. Not only did Wakefield walk four and hit one batter, he threw a wild pitch, and Kottaras added two passed balls - his first of the season with Wakefield on the mound. While Wakefield said he felt good enough to pitch into the eighth, he stood at 112 pitches, and the bullpen had been given a bit of a reprieve Sunday, so there was no need to martyr their knuckleballer. He could get some relief, supplied admirably by Delcarmen, and slightly less admirably by Jonathan Papelbon. Asked if he were on a run, Wakefield said, "I guess so. It seems to be. I feel phenomenal right now. Lot of confidence, throwing a lot of strikes. "Something that we worked hard on in spring training is getting my mechanics down and not getting out of them, and if I do, make corrections during the game. Trying not to get into a big inning." So even though the starters kept the bats contained, the closers - Kerry Wood and Papelbon - didn't quite follow suit. After Wood allowed the three-run homer by Bay, Papelbon began the ninth by allowing two smoked singles to center field, by Shin-Soo Choo and Ryan Garko. He got help on a contested third strike call to Jhonny Peralta, but Mark DeRosa drove in a run with a bouncer up the middle. Papelbon ended it by striking out Kelly Shoppach and getting Ben Francisco to pop up. The only hit Wakefield allowed was a first-inning single to center by Victor Martinez. "There's going to be passed balls, there's going to be some walks, that comes with it," Francona said. "When he starts throwing like this, it's good. It started back in Oakland when we really needed some innings, and he gave us that and more." And so the Sox are on a tear not seen since a 12-game streak in 2006. "I think a lot of things here are clicking for us," Lowell said. "It just seems like the decisions we're making are all working out. We're playing good baseball as well. I don't want to downplay how well we're playing. I just think guys want to ride the wave."